Mudra - My Unavailing Dead end Determination to Reach Awareness is marked by a poignant absence of spacious in thought, speech, behavior and imagination. Nowhere has this become more evident to me than with the current situation with China (Tibet, Darfur, The Olympics, and Human Rights). I want to fight for one side, I want to condemn another. But finding the space in which to allow multiple realities and their multiple truths to exist, and simultaneously on top!, has demanded deep reflection on the spaciousness of Mahamudra, and the necessity of imagination and spaciousness in solving human conflict. Here we sit, the skeptic and believer united in our political, religious, socio-economic, intellectual, foundation all folded in a neat determined dead end struggle. The believer struggles to stay awake to understand, prove, believe, and finally be struck spellbound. The disbeliever struggles to stay awake to not understand, to disprove, disbelieve, and once and for all dispel. And in believers, I mean all of us as adherents to frameworks and systems through which we define ourselves, and by which we permit the definition of our behavior and conduct - compassionate or not. M U D R A. The word. The gesture. The metaphor. We laugh when it seems ridiculous. A word. Hmmf. That's it then? Waste of time. M U D R A. The word. The gesture. The metaphor. We gloat when it seems profound. A word. Magical. That's it then! Time well spent. M U D R A. Say it. Spell it. Write it. Research it. What does it mean to us everyday to sit in contemplative meditative repose with our two hands creating symbolic harmonious Oneness, when our speech, and actions outside of the meditation room are divisive, angry and hateful? "[The Dhyana Mudra] when made with both hands, the hands are generally held at the level of the stomach or on the thighs. The right hand is placed above the left, with the palms facing upwards, and the fingers extended. 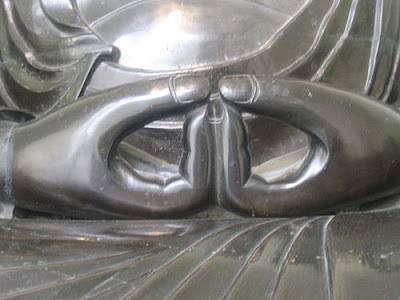 In some cases the thumbs of the two hands may touch at the tips,"
Mahāmudra - The Great Symbol teaching of Tantric Buddhism is a state of awareness attained by meditative methods. This state of awareness is of a natural, single state of non-conceptual mind. 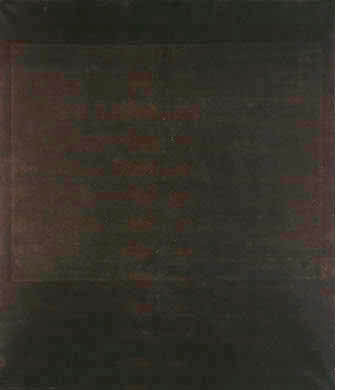 I think of Rothko's last works, like Untitled No.4, as 'mahamudra-esque' contemporary art. "The truth that transcends the intellect will not be seen by means of the intellect. The point of non-action will not be reached by means of deliberate action. If you want to achieve the point of non-action transcending thought, sever the root of mind itself and rest in naked awareness! Leave the polluted water of conceptual thoughts in its [natural] clarity. Without affirming or denying appearances, leave them as they are. When there is neither acceptance nor rejection, [mind] is liberated into mahāmudra ... Freedom from expectation, abiding in its own state, is the supreme king of fruitions." If we are to learn from the current situation with China - and all the interconnected matrices of truth - we must create more inner space. Awareness needs space from the self that binds, itself and others, in constructs. Appearing through a willingness and effort to be imaginative and creative, awareness is spaciousness. Liberation and awareness are not reserved for specific worshipers or followers of one sect, religion or non-belief system, one country, one group but not another, regardless of past, regardless of history. Until there is freedom from expectation, and space for a non-state of non-expectation to exist in imagination, all will be unavailing to believers and non-believers alike, and the contrary. And, all will be conflict, or the contrary. Liberation and awareness is a state available to all with an imagination. Imagination creates a space of acceptance, a space of openness, a space of respect, a space of tolerance, a space for understanding, a space for creative solutions, a space for multiple truths. If we want to work toward a world that respects and considers multiple truths and the effects of systems on people, we must foster spaciousness within, and we must find creative, imaginative ways to live harmoniously. There in the spaciousness of Mahamudra, the Great Symbol, might just be known.